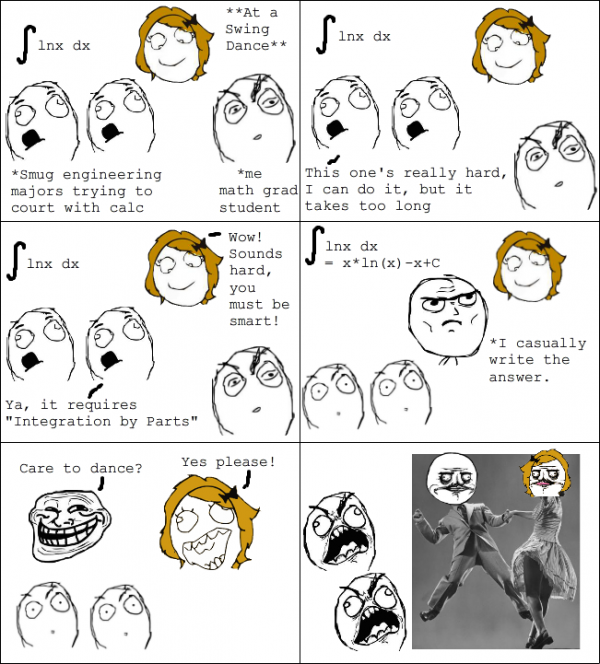 Yup, Integration by Parts is tough stuff. Actuallly it’s high school curiculum in Greece and int of lnx is solved in the book as an example. It all depends of where you live, since educational systems vary from one country to another. Even the duration of what one calls “high school” is not the same, ranging from 2 to 6 years depending on the country. But in general, I think students learn differential and integral calculus when they are around 17 years old, let’s say between 16 and 18.
so…girls will dance with you if you’re good in math? I’m betting the story is true up to panel 4, then pure wish fulfillment.